The U.S. Has Accepted Only 11 Syrian Refugees This Year : Parallels Refugee rights groups say the Trump administration has closed the door on vulnerable Syrian civilians. 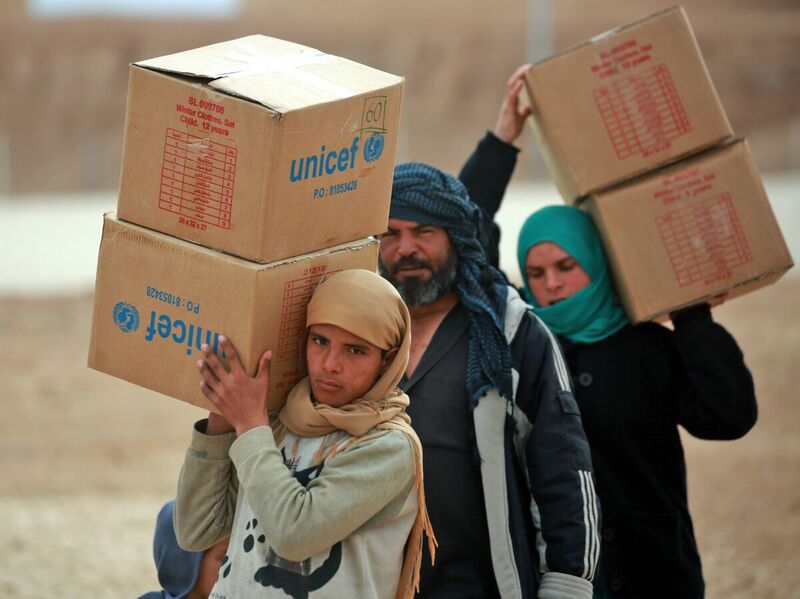 Displaced Syrians, who fled their homes in the city of Deir ez-Zor, carry boxes of United Nations aid at a camp in Syria's northeastern Hassakeh province in February. The Trump administration retaliated Saturday against Syria's suspected chemical weapons attack, launching missiles with France and the U.K. targeting Syrian regime facilities. "This is about humanity, and it cannot be allowed to happen," President Trump said earlier last week, pledging a forceful response to Syrian President Bashar Assad's aggressions. But humanitarian organizations are challenging the president's commitment to humanity when it comes to Syrian civilians — particularly those seeking refuge in the United States. In 2016, near the end of Barack Obama's presidency, the U.S. resettled 15,479 Syrian refugees, according to State Department figures. In 2017, the country let in 3,024. So far this year, that number is just 11. By comparison, over the same 3 1/2-month period in 2016, the U.S. accepted 790. "We are seeing the impact of the Trump administration's words and policy and actions," says Noah Gottschalk, senior policy adviser at Oxfam America. "That slams the door on refugees, and Syrian refugees in particular." Gottschalk says that refugee resettlement has slowed to a trickle, with only 44 Syrians admitted since October 2017. He charges that administration policies aim to dismantle a refugee program mandated by Congress. "What about the humanity of the people who are fleeing those attacks? These are the very people who need our support," Gottschalk insists. Last September, President Trump dramatically reduced the annual cap for refugees from anywhere in the world to 45,000. Arrivals have also slowed because of additional vetting measures, as well as a series of executive orders temporarily barring travel from several Muslim-majority countries and suspending refugees admissions from around the world. Trump administration officials have said that tougher vetting of visitors and refugees was needed because of national security concerns. U.S. federal courts have struck down parts of the bans, but much of the restrictive effects persist, says Becca Heller with the New York-based International Refugee Assistance Project. "I think you can call it a backdoor ban, except that I think it's so blatant and in our faces that I would call it a frontdoor ban. I think they closed the front door to America," Heller says. Yet some officials, including the Trump administration's defense secretary, have spoken out about Syrian refugees. "I've seen refugees from Asia to Europe, Kosovo to Africa. I've never seen refugees as traumatized as coming out of Syria. It's got to end," Defense Secretary Jim Mattis said at a House Armed Services Committee hearing last Thursday. He said the administration is committed to internationally negotiated efforts to end Syria's 7-year-old war, but claimed "we are not going to engage in the civil war itself."